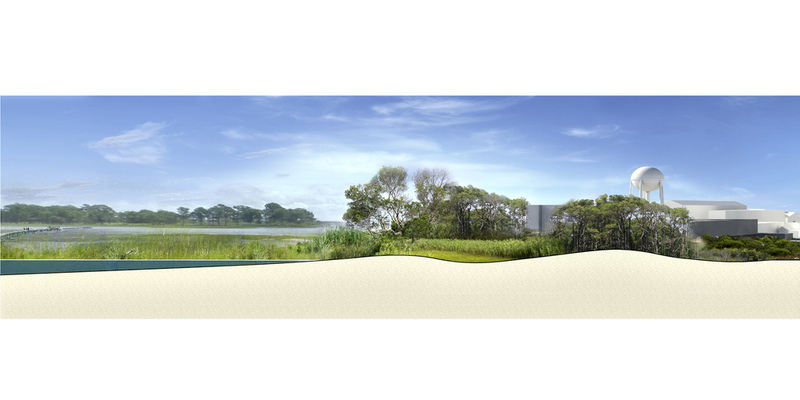 The proposal provides strategies for improving the built and natural environment by strengthening pedestrian connections, creating intelligent architecture, mitigating storm surge, providing resilient energy sources, and restoring native ecologies. OCEAN CITY, MD is a major resort destination on the chain of barrier islands that runs from Florida to Massachusetts and the only major urban area along the Atlantic coast of Maryland. The relationship between Ocean City & Assateague Island exemplifies the major issue of 20th century coastal development - the polarization of urban development and natural systems. Like many other coastal cities, Ocean City could utilize the potential of natural systems to mitigate destruction from storms and strengthen the relationship between the natural and built environment. The Great Hurricane of 1933 cut an inlet dissecting Ocean City & Assateague Island into two separate islands. Wind gusts as high as 80 mph and a 7-foot tide wrecked the boardwalk, flooded the town, demolished whole blocks and killed 13 people. Despite the damage, the inlet was a catalyst for residential development in ecologically sensitive areas of the back-bay. While the inlet created more sand for Ocean City beaches, it prevented long shore drift from replenishing Assateague Island for half a century. Despite the Army Corp’s efforts to pump sand dredged from the inlet, Assateague has eroded a quarter mile further west than Ocean City. 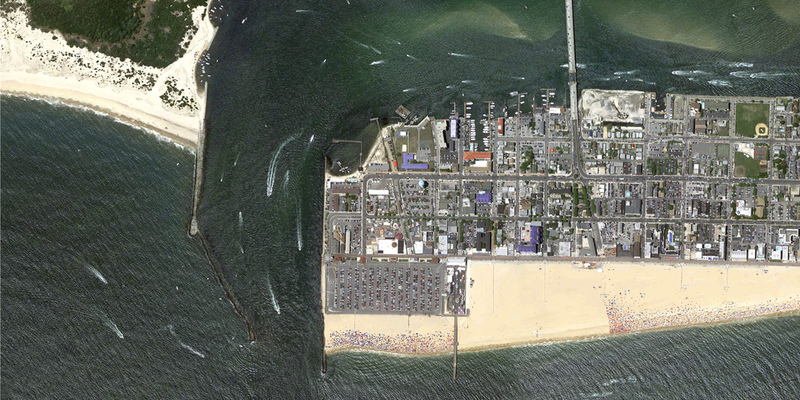 Ocean City’s vulnerability grew concurrently with its development. Tourism shaped the coastal landscape from a naturally evolving barrier island to a flattened beach with a view. OCEAN+CITY’s reinterpretation of a double dune system protects the city from storm surge while doubling its commercial boardwalk. 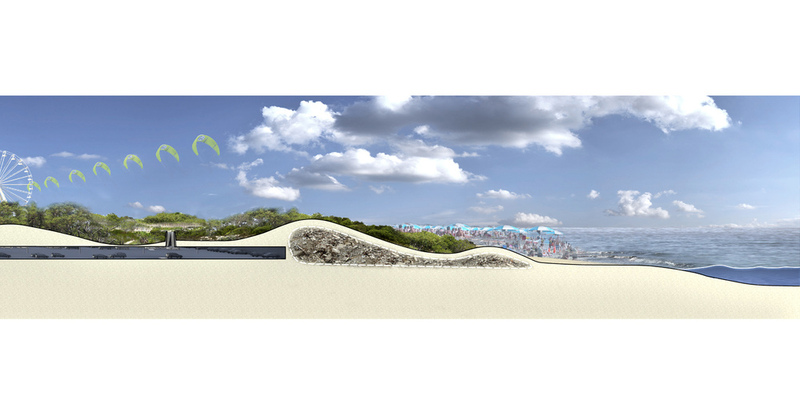 The combination of concrete structures and vegetation provides a foundation to re-grow the dune system post-hurricane. Rebuilding dune fields protects the back-bay ecology and promotes environmentally responsible development. Stabilized by plant structures, dunes help mitigate storm surge & create habitat for the native coastal ecologies. Dune fields also permit stormwater infiltration to restore the aquifer that is critical for the success of coastal plant succession. Storm surge on the bay side is the primary source of flooding in Ocean City. An inflatable barrier along the proposed bridge piers are deployed during storm events to divert water into the dune fields providing the first line of defense in flood protection. The bridge reconnects Assateague and Fenwick Island and Ocean City to its core: a barrier island dune field. The bridge also protects and restores degraded bay and marshland habitats. These ecosystems are critical for flood protection and the health of the water. Capturing the kinetic energy of coastal winds provides emergency relief from power outages during storm events. Deployable Traction Kite Power Plants capture wind and provide alternative energy to Ocean City. These energy generators would be deployed regularly to educate the public for their use in times of crisis. Integrating architecture into the dune field anchors both the social and ecological functions of Ocean City. A scalloped architectural shell protects the community from storm surge, integrates commercial activity into the dune field, and provides a foundation for sand accumulation and coastal plant succession. A Barrier Island History Museum & Coastal Research Facility provides tourists, community, and scientists a venue to understand the diverse coastal ecological systems and storms.